Kevin Luke "Cub" Swanson (born November 2, 1983) is an American mixed martial artist. He competes as a featherweight in the Ultimate Fighting Championship. As of April 1, 2019, he is ranked #10 in the official UFC featherweight rankings. Swanson was born and raised mostly in Palm Springs, California. He had a Swedish-American father, a Mexican mother and four siblings. Swanson's father died three months after he was born. Because of his mother's heavy grieving, Swanson and his siblings were then adopted by a distant relative until his mother healed. The adoptive family was religious so Swanson spent most of his early life in church. Swanson was also home-schooled for most of his young life. However, when Swanson was 14, his adoptive parents divorced and he returned to his mother. He then went to Cathedral City High School, along with future boxer Timothy Bradley. As a teenager, Swanson associated himself with local gangs and participated in many streets fights. He also drank alcohol and took recreational drugs. The police arrested Swanson and two of his friends for committing a house robbery. As a result, Swanson was placed in a juvenile detention center. He was released when he was 17 years old. At the age of 19, Swanson started working for United Cerebral Palsy, where he helped children with social disabilities. Swanson started playing soccer from the age of four. He even thought of playing in the World Cup. UFC fighter Joe Stevenson invited Swanson to train with him, which he accepted. This marked Swanson's transition into professional MMA. On July 25, 2004, Cub Swanson made his first professional fight. MMA was not sanctioned in California in 2004, so Swanson competed at Total Combat in Mexico. His opponent, Shannon Gugerty, submitted Swanson via Rear-Naked Choke. The fight lasted for just 30 seconds. Despite the loss, Swanson continued to compete in professional MMA fights. Swanson won nine fights before entering the WEC in 2007. This included a rematch with Gugerty in 2006. Other than TC, Swanson also competed in KOTC and BIB. On his WEC debut on March 24, 2007, Swanson submitted Tommy Lee by guillotine choke. Swanson earned a disclosed pay of $6000. He next defeated Micah Miller at WEC 28 via unanimous decision. Swanson was scheduled to fight Jens Pulver in Pulvers 145lb debut, the fight was pushed back three months when Pulver sustained an injury in training camp; Swanson accused Pulver of trying to duck the fight, which Pulver denied. They finally met at WEC 31, with Swanson losing via guillotine choke. The fight only lasted 35 seconds and marked the end of Swanson's eleven fight winning streak. Hiroyuki Takaya took on Swanson on December 3, 2008, at WEC 37. Swanson won via unanimous decision. Both fighters earned the Fight of the Night honors. This was Swanson's first official WEC award. WEC schedule Swanson to fight Diego Nunes on April 5, 2009, at WEC 40. Nunes withdrew from the fight days before the bout due to a hand injury. Swanson fought with José Aldo at WEC 41 on June 7. Just 8 seconds into the first round, Swanson lost by TKO via a double flying knee. Nevertheless, WEC gave Swanson a disclosed pay of $8940 Base. Swanson defeated John Franchi via submission on November 18 at WEC 44. The fight earned Swanson his second Fight of the Night honor. In his bout against Franchi, Swanson broke both of his hands. WEC scheduled Swanson to fight WEC newcomer Chan Sung Jung. Swanson withdrew from the card with an injury. He would be replaced by Leonard Garcia. On August 18, 2010, WEC 50, Swanson faced Chad Mendes. Mendes came from a wrestling background. He took Swanson down multiple throughout the fight. Swanson lost via unanimous decision. Swanson faced Mackens Semerzier next on November 11 at WEC 52. He won the fight via split decision. The bout was an exciting back and forth affair that earned both fighters Fight of the Night honors. On October 28, 2011, WEC merged with Ultimate Fighting Championship. As part of the merger, most WEC fighter contracts transferred to UFC. Swanson was expected to face Erik Koch on March 3, 2011 at UFC Live: Sanchez vs. Kampmann. However, Swanson pulled out of the bout due to an injury. Swanson vs. Koch was rescheduled to take place on July 2 at UFC 132. However, Swanson was forced out of the bout with another injury. After just over a year out of action, Swanson returned to face Ricardo Lamas on November 12 at UFC on Fox 1. Swanson was the last WEC fighter imported from the WEC/UFC merger to debut in the UFC. He lost the fight via submission (arm triangle choke) in the second round. In his second UFC fight, Swanson faced George Roop on January 28, 2012, at UFC on Fox: Evans vs. Davis. Prior the fight, Swanson said "I just really want to smash this kid". He boasted "I'm the more complete fighter and I have the tools to shut him down". Swanson won the fight via TKO in the second round. Ross Pearson and Swanson went head-to-head on June 22 at UFC on FX 4. Swanson won the fight via TKO in the second round, earning him Knockout of the Night bonus. Swanson fought Charles Oliveira as an underdog on September 22 at UFC 152. Swanson won the fight by knockout in the first round. Swanson received a Knockout of the Night bonus. Swanson was expected to face Dennis Siver on February 16, 2013, at UFC on Fuel TV: Barao vs. McDonald. However, Siver pulled out of the bout. Dustin Poirier took Siver's spot. Swanson won by unanimous decision. As of March 2013, Swanson was ranked the #10 Featherweight in the world by Sherdog and ranked #5 within the UFC. Swanson's bout with Dennis Siver was rescheduled for July 6, 2013, at UFC 162. Swanson won via TKO in the third round. The performance earned both participants Fight of the Night honors. Swanson challenged Jeremy Stephens on June 28 at UFC Fight Night 44. Swanson won via unanimous decision. The performance earned both participants Fight of the Night honors. Swanson next faced Frankie Edgar on November 22 at UFC Fight Night 57. Prior the fight, UFC president Dana White promised that "If Cub Swanson wins this fight, we did tell him we would give him a title shot." "All I know is that," Swanson told Sherdog.com, "in my mind, I finish Frankie Edgar, that I'm getting that title shot. That's all that's on my mind.". Swanson lost the one-sided fight via submission in closing seconds of the fifth round. Max Holloway challenged Swanson on April 18, 2015 at UFC on Fox 15. Swanson was out-struck in the first two rounds. Holloway then set up a guillotine choke in the third round, forcing Swanson to tap out. Following the fight, Swanson announced via Twitter that he had suffered a broken jaw and a broken right hand. The two-loss-streak made Swanson drop out as a title contender. "It's really hard to explain," said Swanson in an interview, "You want something so bad and it may come and it may not, you can go crazy doing all of that." At his #10 UFC fight, Swanson faced Hacran Dias on April 16, 2016, at UFC on Fox 19. Swanson won the fight via unanimous decision. Swanson faced Tatsuya Kawajiri on August 6 at UFC Fight Night 92. "I've been around forever, he's been around forever, so we're both just looking for a win," said Swanson in an interview. During the fight, Swanson kneed Kawajiri to the head, which was illegal since Kawajiri was downed at the time. Referee John McCarthy paused the fight shortly but no points are deducted from Swanson. Swanson won the back and forth fight via unanimous decision. Swanson fought with touted prospect Doo Ho Choi on December 10 at UFC 206. Cub Swanson won the fight via unanimous decision. "I knew he (Choi) deserved the hype," said Swanson during the post-fight interview, "but he made a mistake calling me out. I wanted to prove to everyone that I've still got it. Don't write me off again." Both participants were awarded Fight of the Night and later was awarded Fight of the Year at the World MMA Awards. Underdog Artem Lobov challenged Swanson to a fight on April 22 at UFC Fight Night 108. Swanson won the fight via unanimous decision . The fight broke the record for most significant strikes landed (209) in a UFC Featherweight bout and in a UFC Fight Night. It also came #4 in most significant strikes landed in a single bout. Subsequently, both participants were awarded a Fight of the Night awards. This was Swanson's sixth Fight of the Night bonus. He broke his hand for the 10th time in his career. Swanson faced Brian Ortega on December 9, 2017 at UFC Fight Night 123. He lost the back-and-forth fight via submission in the second round. Despite the loss, Swanson earned his third consecutive (and fifth overall) Fight of the Night bonus award. The fight with Ortega also marked the last bout of his contract and albeit taking offers from a variety of promotions, he decided to re-sign with the UFC due to consistent drug testing by USADA. Swanson faced Frankie Edgar in a rematch on April 21, 2018 at UFC Fight Night 128. He lost the fight via unanimous decision. Swanson faced Renato Moicano on August 4, 2018 at UFC 227. He lost the fight via a rear-naked choke submission in the first round. Swanson is expected to face Shane Burgos on May 4, 2019 at UFC Fight Night 150. Swanson is known for his creative striking. Many pundits cite Swanson's ducking roundhouse kick / cartwheel kick to the head as his most distinct move. Swanson often sets up with a left hook, then follow up with a ducking roundhouse kick to the head. This combination was used against Artem Lobov. In other cases, Swanson would throw a single ducking roundhouse kick with no set up, like in his fight with Ross Pearson and Doo Ho Choi. Swanson's movements are very unorthodox. He tends to feint while punching, as exemplified in WEC 52. Swanson often switches stance after kicking, something which he did against Dennis Siver. He also puts a lot of weight into his punches. Weight shifts gives him more power but shifts him off balance. This makes Swanson susceptible to take downs and counters. Similarly, Swanson's stance switches make him vulnerable to leg kicks. Low kicks tend to disrupt his footwork. The UFC acknowledges Swanson's ground game. In his fight with Doo Ho Choi and Dennis Siver, Swanson escaped from inferior positions. Despite this, 7 out of Swanson's 10 losses are by submission. This raises questions over Swanson's submission defense. Swanson stated on his UFC profile that Superman double wrist lock is his favorite move. However, he has never submitted any of his opponents using that move. Swanson stated that Bruce Lee inspired him as a fighter. Swanson began training MMA in 2003. His typical workout routine involves striking in the morning and cardio exercises in the afternoon. Grappling sessions take place at night. Brazilian Jiu-jitsu medalist Rigan Machado coaches Swanson's BJJ. Former boxing champion Joel Díaz teaches Swanson boxing. Cub Swanson owns an MMA gym, Tru MMA, in Indio, California. UFC Gym partnered with Swanson to open a UFC Gym in Costa Mesa. Swanson taught intermediate MMA classes at the UFC Gym on May 10, 2017. Classes included Boxing, kickboxing and Brazilian Jiu-Jitsu. "As a native of Southern California," remarked Swanson on the UFC website,"I look forward to bringing this community, which is both near and dear to my heart, a myriad of amazing amenities and programs to help them TRAIN different and live a healthier lifestyle." Swanson married Kenda Perez on June 1, 2018. The two had their first child, Royal Rae Swanson, on August 21, 2017. Their identical twin sons, Saint Cub Swanson and King Cub Swanson, were born on September 2, 2018. Steve Swanson, Cub Swanson's older brother, also competes in MMA. The two brothers train in and run their MMA gym Tru Gym together. In his spare time, Swanson plays golf near his hometown at Indio, California. Golf club design enterprise PowerBilt sponsors Swanson. Loss 25–8 Brian Ortega Submission (guillotine choke) UFC Fight Night: Swanson vs. Ortega December 9, 2017 2 3:22 Fresno, California, United States Fight of the Night. Win 25–7 Artem Lobov Decision (unanimous) UFC Fight Night: Swanson vs. Lobov April 22, 2017 5 5:00 Nashville, Tennessee, United States Fight of the Night. Win 24–7 Doo Ho Choi Decision (unanimous) UFC 206 December 10, 2016 3 5:00 Toronto, Ontario, Canada Fight of the Night. Fight of the Year (2016). Win 21–5 Jeremy Stephens Decision (unanimous) UFC Fight Night: Swanson vs. Stephens June 28, 2014 5 5:00 San Antonio, Texas, United States Fight of the Night. Win 20–5 Dennis Siver KO (punches) UFC 162 July 6, 2013 3 2:24 Las Vegas, Nevada, United States Fight of the Night. Win 18–5 Charles Oliveira KO (punch) UFC 152 September 22, 2012 1 2:40 Toronto, Ontario, Canada Catchweight (146.4 lbs) bout; Oliveira missed weight. Knockout of the Night. Win 17–5 Ross Pearson TKO (punches) UFC on FX: Maynard vs. Guida June 22, 2012 2 4:14 Atlantic City, New Jersey, United States Knockout of the Night. Win 15–4 Mackens Semerzier Decision (split) WEC 52 November 11, 2010 3 5:00 Las Vegas, Nevada, United States Fight of the Night. Win 14–3 John Franchi Submission (guillotine choke) WEC 44 November 18, 2009 3 4:50 Las Vegas, Nevada, United States Fight of the Night. Win 13–2 Hiroyuki Takaya Decision (unanimous) WEC 37 December 3, 2008 3 5:00 Las Vegas, Nevada, United States Fight of the Night. Win 7–1 Richard Montano Decision (unanimous) KOTC: Rapid Fire August 4, 2006 2 5:00 San Jacinto, California, United States Featherweight debut. ^ "UFC on FX 4 winner Cub Swanson unsure of nickname, but knows he wants title shot". June 26, 2012. Retrieved August 20, 2017. ^ Chad Dundas (April 20, 2017). "Why Is Cub Swanson, the UFC's 4th-Best Featherweight, Fighting Artem Lobov?". Retrieved August 20, 2017. ^ a b Helen Mei (June 24, 2014). "Killer Cub Swanson on Life of Partying before MMA". Retrieved August 21, 2017. ^ a b c d e f g h "Cub Swanson - Official UFC Fighter Profile". UFC.com. Retrieved November 23, 2014. ^ "Cub Swanson". Sherdog. Retrieved October 31, 2017. ^ "Fight Card - UFC Fight Night Machida vs. Rockhold". UFC.com. Retrieved April 19, 2015. ^ "FightMetric LLC :. : The World's First Comprehensive MMA Statistics Provider". Retrieved August 21, 2017. ^ a b "UFC 206: Boxing Coach Joel Diaz on Cub Swanson's Victory Over Dooho Choi". December 11, 2016. Retrieved August 20, 2017. ^ Andrew L. John (March 21, 2017). "Surprise sprung on Cub Swanson after winning Fight of the Year". desertsun.com. Retrieved March 21, 2017. ^ Blake Arthur (August 21, 2017). "Cub Swanson becomes a father with birth of baby girl". Retrieved August 27, 2017. ^ "Fighter Rankings | UFC ®". UFC. Retrieved 2019-04-01. ^ "Cub Swanson High School". Archived from the original on August 19, 2014. ^ "Cub Swanson dreamed of playing in World Cup before UFC career". June 26, 2014. ^ a b Shaun Al-Shatti (January 19, 2017). "For the Swanson brothers, fighting — and survival — is a family affair". mmafighting.com. Retrieved August 1, 2017. ^ Duane Finley (October 20, 2012). "No regrets for Cub Swanson as he battles for respect in the UFC". bleacherreport.com. Retrieved August 21, 2017. ^ Staff (December 4, 2008). "WEC 37 FIGHTER AWARDS NET $7,500 BONUSES". mmaweekly.com. ^ Larry Csonka (April 2, 2009). "Diego Nunes Injured, WEC 40 Fight With Cub Swanson Off". 411mania.com. Archived from the original on May 18, 2015. ^ a b "Cub Swanson MMA Fighter page". tapology.com. Retrieved August 1, 2017. ^ "WEC 44: Brown vs. Aldo results". www.wec.tv/index.cfmom. November 19, 2009. ^ "WEC 44 bonuses: Aldo, Roller, Swanson and Franchi earn $10,000 awards". MMAJunkie.com. Archived from the original on July 11, 2012. Retrieved November 19, 2009. ^ "Cub Swanson set to welcome the 'Korean Zombie' to WEC 48 on April 24". mmamania.com. Retrieved March 12, 2010. ^ "Leonard Garcia Replaces Cub Swanson, Fights Jung at WEC 48 in April". mmafrenzy.com. Retrieved March 27, 2010. ^ "Chad Mendes vs Cub Swanson AT WEC 50 in August". MMAWeekly.com. June 22, 2010. ^ Staff (September 27, 2010). "WEC 52 Main Card Set for Nov. 11, Swanson vs. Semerzier Added to Prelims". News. mmafrenzy.com. Retrieved September 27, 2010. ^ John Morgan (November 11, 2010). "WEC 52 preliminary-card recap: Assuncao, Njokuani, McDonald and Swanson shine". News. mmajunkie.com. Retrieved November 11, 2010. ^ John Morgan (November 12, 2010). "WEC 52 bonuses: Koch, Faber, Swanson and Semerzier earn $10K awards". mmajunkie.com. ^ "WEC vets Eric Koch vs. Cub Swanson targeted for UFC on Versus 3". mmajunkie.com. January 10, 2011. Archived from the original on January 11, 2011. ^ "Cub Swanson out at UFC on Versus 3, Erik Koch awaits new opponent". mmajunkie.com. February 24, 2011. Archived from the original on February 26, 2011. ^ "Erik Koch vs. Cub Swanson rebooked for July's UFC 132 event in Las Vegas". mmajunkie.com. April 6, 2011. Archived from the original on April 8, 2011. ^ "Training injury forces Cub Swanson out of UFC 132, Erik Koch awaits new foe". mmajunkie.com. June 2, 2011. Archived from the original on June 5, 2011. ^ "Cub Swanson vs Ricardo Lamas booked for Nov. 12 in Anaheim". mmamania.com. September 3, 2011. ^ "UFC on FOX 2 adds Roop vs. Swanson". mmajunkie.com. December 5, 2011. Archived from the original on December 8, 2011. ^ "Ross Pearson vs. Cub Swanson added to UFC on FX 4 in New Jersey". mmajunkie.com. March 29, 2012. Archived from the original on July 12, 2012. ^ "Charles Oliveira vs Cub Swanson in the works for UFC 152 in Toronto". mmamania.com. August 2, 2012. ^ "UFC 152 Results: 'Jones vs. Belfort' Play-by-Play & Updates". mmajunkie.com. September 22, 2012. Retrieved August 7, 2012. ^ "UFC 152 Bonus Winners". TopMMANews.com. September 22, 2012. ^ Staff (December 12, 2012). "Cub Swanson vs. Dennis Siver Set as Co-Main Event for UFC on Fuel 7 in England". mmaweekly.com. Retrieved December 12, 2012. ^ "Dustin Poirier replaces Dennis Siver, meets Cub Swanson at UFC on FUEL TV 7". mmajunkie.com. January 17, 2013. ^ "UFC on Fuel TV 7 Results: 'Barao vs. McDonald' Play-by-Play & Updates". sherdog.com. February 16, 2013. Retrieved August 7, 2017. ^ Tom Ngo (March 28, 2013). "Dennis Siver Faces Cub Swanson at UFC 162". 5throundcom. Retrieved March 28, 2013. ^ "UFC 162 Results: 'Silva vs. Weidman' Play-by-Play & Updates". sherdog.com. July 6, 2013. Retrieved August 7, 2017. ^ Mike Chiapetta (July 6, 2013). "UFC 162 results: Cub Swanson knocks out Dennis Siver". mmafighting.com. Retrieved July 6, 2013. ^ Mike Whitman (July 7, 2013). "UFC 162 bonuses: Weidman, Edgar, Oliveira, Swanson, Siver bank $50K each". sherdog.com. Retrieved July 7, 2013. ^ Damon Martin (March 18, 2014). "Cub Swanson vs. Jeremy Stephens headlines UFC Fight Night in San Antonio". msn.foxsports.com. Retrieved March 18, 2014. ^ "UFC Fight Night Results: 'Swanson vs. Stephens' Play-by-Play & Updates". sherdog.com. June 28, 2016. Retrieved June 29, 2014. ^ Dave Doyle (June 29, 2016). "UFC Fight Night 44 results: Cub Swanson defeats Jeremy Stephens for sixth in a row". mmafighting.com. Retrieved June 29, 2014. ^ Staff (June 29, 2014). "UFC Fight Night 44 bonuses: Swanson, Stephens, Borg, Carlos Diego Ferreira get $50,000 awards". mmajunkie.com. Retrieved June 29, 2014. ^ Mike Dyce (September 24, 2014). "Cub Swanson to fight Frankie Edgar in main event of UFC Fight Night in Austin". fansided.com. Retrieved September 24, 2014. ^ "UFC's Cub Swanson open to move to pro boxing". November 21, 2014. Retrieved August 1, 2017. ^ Tristen Critchfield (November 19, 2014). "UFC Featherweight contender Cub Swanson Admits to Considering Pro Boxing Career". sherdog.com. Retrieved August 2, 2017. ^ Jamie Penick (November 23, 2014). "UFC Fight Night 57 Results: Frankie Edgar scores latest stoppage in UFC history in dominant win over Cub Swanson". mmatorch.com. Retrieved November 23, 2014. ^ Marc Raimondi (February 15, 2015). "Cub Swanson vs. Max Holloway targeted for UFC on FOX 15 in April". mmafighting.com. Retrieved February 15, 2015. ^ Nick Baldwin (January 30, 2016). "Cub Swanson vs. Hacran Dias set for UFC on FOX 19". bloodyelbow.com. Retrieved January 30, 2016. ^ Ben Fowlkes (April 16, 2016). "UFC on FOX 19 results: Cub Swanson gets much-needed win, tops Hacran Dias". mmajunkie.com. Retrieved April 16, 2016. ^ Ariel Helwani (June 14, 2016). "Cub Swanson vs. Tatsuya Kawajiri targeted for UFC Fight Night in Utah". mmafighting.com. Retrieved June 14, 2016. ^ E.Spencer Kyte (August 3, 2016). "Keyboard Kimura: Cub Swanson bearish on getting an eventual title shot". theprovince.com. Retrieved August 5, 2017. ^ Brent Brookhouse (August 6, 2016). "UFC Fight Night 92 results: Cub Swanson survives Tatsuya Kawajiri takedowns for decision win". mmajunkie.com. Retrieved August 5, 2017. ^ Brent Brookhouse (August 6, 2016). "UFC Fight Night 92 results: Cub Swanson survives Tatsuya Kawajiri takedowns for decision win". mmajunkie.com. Retrieved August 6, 2016. ^ "Cub Swanson vs. Dooho Choi added to UFC 206 in Toronto". mmajunkie.com. October 13, 2016. Retrieved October 13, 2016. ^ Dave Doyle (December 10, 2016). "UFC 206 results: Cub Swanson wins magnificent matchup over Doo Ho Choi". mmafighting.com. Retrieved December 10, 2016. ^ Tristen Critchfield (December 10, 2016). "UFC 206 bonuses: Swanson, Choi, Holloway, Vannata receive $50K awards". sherdog.com. Retrieved December 10, 2016. ^ "Winners Archive - World MMA Awards : World MMA Awards". 2017-08-05. Archived from the original on 2017-08-05. Retrieved 2017-08-19. ^ Staff (February 11, 2017). "Cub Swanson vs. Artem Lobov headlines UFC Fight Night 108 in Nashville on April 22". mmajunkie.com. Retrieved February 11, 2017. ^ Steven Marrocco (April 23, 2017). "UFC Fight Night 108 results: Cub Swanson takes intense unanimous decision over Artem Lobov". mmajunkie.com. Retrieved April 23, 2017. ^ Tristen Critchfield (April 23, 2017). "UFC Fight Night 108 bonuses: Swanson, Lobov, Perry, Moreno garner $50K checks". sherdog.com. Retrieved April 23, 2017. ^ Staff (April 27, 2017). "Cub Swanson won his UFC headliner – and broke a hand for the 10th time". mmajunkie.com. Retrieved August 1, 2017. ^ Staff (2017-10-02). "Cub Swanson says he's headlining UFC Fight Night 123 against Brian Ortega". mmajunkie.com. Retrieved 2017-10-02. ^ Wells, Adam. "UFC Fight Night 123 Results: Brian Ortega Beats Cub Swanson Via Submission". Bleacher Report. Retrieved 2017-12-10. ^ Staff (2017-12-10). "UFC Fight Night 123 bonuses: Brian Ortega's amazing performance doubles up for $100,000". MMAJunkie.com. Retrieved 2017-12-10. ^ Damon Martin (January 16, 2018). "Cub Swanson Enters Free Agency, Plans to Speak to Multiple Promotions Including UFC". mmaweekly.com. ^ Shaun Al-Shatti (August 2, 2018). "Cub Swanson says USADA played big part in re-signing with UFC, has hard time believing tainted supplement 'excuses'". mmafighting.com. ^ Staff (2018-03-20). 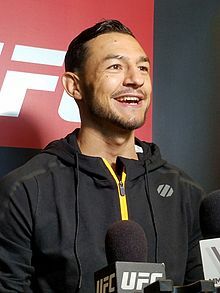 "Cub Swanson vs. Frankie Edgar rematch headed to UFC-Atlantic City". mmajunkie.com. Retrieved 2018-03-20. ^ "UFC Fight Night 128 results: Frankie Edgar tops Cub Swanson in rematch". MMAjunkie. 2018-04-22. Retrieved 2018-04-22. ^ Dale Jordan (2018-05-09). "Cub Swanson vs. Renato Moicano added to UFC 227 in Los Angeles". mmamad.com. Retrieved 2018-05-09. ^ "UFC 227 results: Renato Moicano drops, submits Cub Swanson in opening round". MMAjunkie. 2018-08-05. Retrieved 2018-08-05. ^ "Shane Burgos vs. Cub Swanson added to UFC on ESPN+ 8 in Ottawa". MMA Junkie. 2019-03-27. Retrieved 2019-03-28. ^ a b "Cub Swanson Is Giving Back". September 1, 2014. Retrieved August 8, 2017. ^ "Should a decision win over an unranked opponent really net Cub Swanson a UFC title shot?". April 24, 2017. Retrieved August 1, 2017. ^ "Cub Swanson fight news". Retrieved August 1, 2017. ^ a b Dan Shapiro (June 19, 2014). "On Cub Swanson, Jazz and MMA". ^ a b "Cub Swanson: Winning Without Moving Forward". ^ a b Andrew Richardson (April 20, 2017). "Fighter on Fighter: Breaking down UFC Fight Night 108's Cub Swanson". Retrieved August 11, 2017. ^ "Atomic leg drops: Why MMA needs signature moves". ^ "Connor Ruebusch" (July 16, 2013). "UFC 162 Judo Chop: Slingin' Leather with Cub Swanson". Retrieved August 2, 2017. ^ "Cub Swanson MMA stats Pictures, News, Videos, Biography". Retrieved August 1, 2017. ^ "I'm Cub Swanson :) AMA : MMA". Retrieved July 31, 2017. ^ "UFC champ Michael Bisping, Cub Swanson celebrate UFC gym Costa Mesa grand opening on Satureday". May 9, 2017. Retrieved June 20, 2017. ^ "Cub Swanson on Facebook". May 9, 2017. Retrieved August 1, 2017. ^ "Cub Swanson IG Post - Royal Rae Swanson was born this morning at 4:03 AM / 8-21-17 / @kendaperez with the amazing per..." August 21, 2017. Retrieved August 27, 2017. ^ Mike Bohn (June 2, 2018). "Cub Swanson and Kenda Perez get married, Memorial Day". mmajunkie. Retrieved August 2, 2018. ^ Mike Bohn (September 9, 2018). "MMA's week out of the cage: Fighters mourn Mac Miller, Cub Swanson's twin boys arrive". mmajunkie.com. ^ Cecil. K. Brissette. "Cub Swanson: Golf's Ultimate Fighter and Unlikeliest Pitchman". Retrieved August 21, 2017. ^ "Can Cub Swanson and MMA be the Key to Saving Golf?". September 8, 2014. Retrieved August 21, 2017. ^ "PowerBilt Supports MMA Star Cub Swanson On Upcoming Bout". Jun 25, 2014. Retrieved August 21, 2017. ^ "Gleichschaltung(2018) - Full Cast & Crew". ^ "Fight of the Month for June 2014". MMAJunkie.com. Retrieved July 30, 2017. ^ "Cub Swanson vs Doo Ho Choi UFC MMA". ESPN. Retrieved July 30, 2017. ^ Sherdog.com. "First Team". m.sherdog.com. ^ DNA, MMA. "MMA DNA UFC Awards 2016 : De Uitslagen!!!". Retrieved 2019-01-28.